Most people feel it’s very difficult to open a bank in Nigeria, but the truth is it takes some few minutes of your time. You just have to stroll into the desired bank and follow these simple steps am about to give you. When you have decided the bank you wish to bank with just stroll in with or without cash, yes you heard me. When you are in the banking hall, locate the customer care unit. Next, tell the customer care rep you want to open an account. The customer care rep may tell you to go upstairs and sit; sometimes you may be served tea. Lol! You will then be asked to meet some special staffs in charge of account opening, they are called account officers. National I.D to be precise. But what if you don't have it? Worry not, this will not change anything if you have either your national identification number (NIN) or Voter’s card. In my own case I used my voter’s card. Next you will be asked for two passport photographs, utility bill Or any bill payment receipt that contains your house address. This is for the purpose of address verification. When you presented these documents you are very much good to go. Now is the time you will be asked the type of account you wish to open, student or normal. When you have made your choice you will be given a form to fill. Ensure you fill correctly and use a signature specimen you can remember. Don’t just sign because they said sign. I was a victim of this as I have to go get a court affidavit to change my signature. Well I was a bit young then. When you are done filling your part of the form, submit it to the accounts officer and she/he will fill his/her part too. Next, you will be asked me if you want to make any deposit in the account, in my time I deposited about Eight thousand Naira. In a matter of minutes I was given my account number. Next, they will create a Bank verification number for you, so they may ask you to take the form to another section of the bank. Issuance of BVN may take a little while as it is the duty of the central bank of Nigeria to generate it. Now your account is ready and set for use, you just have to wait at most 24 hours for your BVN. Wait, do you think this process is still lengthy and rigorous? Let me tell you how you can open your bank account from the comfort of your home. I guess you have an internet enabled device. Now visit the website of any of the banks you wish to operate with. 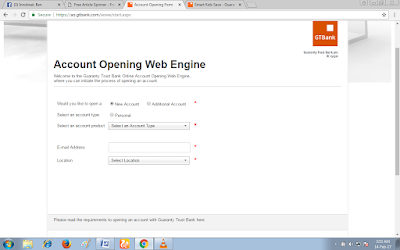 Let’s use GT-bank as a case custody now, when you visit their web page navigate to the accounts opening section. To do this, go to services, click on accounts opening form. Next you will be redirected to the account opening web page. All you have to do now is supply our details and choose the desired you wish to open. Now pick your choice and proceed. Folks, the internet have made everything simple and flexible; why not take advantage of it? You can also open bank accounts in Nigeria by dialing short USSD codes, just find out and you will see how easy it is. Thanks let us know how you feel in the comments section.